Beijing 2012: VW E-Bugster | What Car? 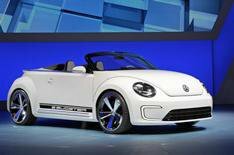 The VW E-Bugster concept car unveiled at the 2012 Beijing motor show gives the best idea yet of how the Volkswagen Beetle Cabriolet will look when it arrives in 2013. Although Volkswagen unveiled the E-Bugster at the 2012 Detroit motor show, the car on display at Beijing has its hard-top roof removed, so provides a better view of a Beetle with its top down. VW calls the E-Bugster a sports car; it has a sleeker look than the Beetle hatchback, with a more swept-back windscreen and a lower, wider body. The more aggressive bumpers and wider wheelarches hint at how a high-performance R version of the Beetle could look, although the Beetle Cabriolet is likely to have a higher roofline, similar to the hatchbacks. The E-Bugster concept car is fully electric, with a 114bhp motor powered via lithium-ion batteries; theyre mounted behind the front seats, making the car a strict two-seater. VW quotes a a 0-62mph time of 10.9sec and a range of at least 112 miles. Quick charging takes around 35 minutes. ?